I began writing Fearless Salary Negotiation in January 2015 and finished writing it in July. But it took me until September or so to decide exactly how to publish it. This wasn’t an easy decision and there were a lot of variables to consider. The Authority option—Build an audience, provide great content, and sell a premium product at a premium price directly to that audience. Short version: smaller audience, higher price, not very discoverable. The Amazon option—Distribute the book through Amazon at a lower price, leveraging my own audience, but also counting on longer-term sales through Amazon’s enormous user base and search capabilities. Short version: enormous potential audience, very low price, very discoverable. My first option was to go with the “Authority” option, which was based on Nathan Barry’s book Authority. The basic idea is to build an audience in the form of an email list, provide overwhelmingly good content to that audience over time, and then sell the book directly to that audience. I could sell the book in all eBook formats (mobi, ePub, PDF) along with an audiobook version and other things like case studies and worksheets for around $39. Then I would add a couple more pricing tiers with even more value, up to the top tier with two video courses on interviewing and salary negotiation for around $299. I would be providing more value at a higher price. Each sale would be $39+, which would really add up. For the price points I was considering, I would keep around 95% of revenue, which is far superior to Amazon’s royalty structure, where I would keep 70% of revenue at best, and as little as 30-40% at worst. I could self-publish and use Gumroad for distribution. Gumroad is great because the fees are so low and the buyer experience is so great. I was already selling Mastering Business Email packages on Gumroad and the user experience was very good. I could only sell to people who knew me, and other people would be unlikely to find the book. It looked like I would have 500-750 people on my email list by the time I launched, and I just wasn’t confident I could get a ton of those people to buy my book. Yes, each sale would be 10x the revenue of an Amazon sale, but I wasn’t sure how to get lots of sales and, more importantly, I wasn’t sure how I would get future sales after the launch. This option requires a lot more material to do the launch properly. The bottom tier would mostly just be the book in various forms, but in order to offer higher tiers, I would have to create more things: case studies, video courses, audiobook, etc. That’s a lot of work and I wasn’t sure I could get all of those things done before I wanted to launch. The more vanilla plan would be to publish the book as a paperback and eBook on Amazon. I could also throw in the audiobook version if I had the time. The difference would primarily be price: I could go as high as $9.99 for the Kindle book and up to $19.99 or so for the paperback. That’s a really big different in price. But it would also mean that I could shoot for #1 in one or more Amazon categories, and my book would be discoverable by the millions of people who use Amazon and search for things there. I also had to consider my longer-term plan, which was to offer premium video courses, coaching, and consulting. Finding customers for those products would require credibility, and a successful book on Amazon could provide that. People who didn’t know me could discover and buy my book. Doing well on Amazon would also give me credibility that may be difficult to get if I totally self-published and self-distributed through Gumroad. Amazon rankings and reviews carry a lot of weight and even carry bragging rights in some cases. I wouldn’t necessarily have to create all of the content I had planned before launching the book. I wouldn’t need video courses, case studies, and other things that would be needed to fill out the higher-priced tiers on Gumroad. I could easily offer a paperback version of my book. Amazon’s partnership with CreateSpace makes this relatively easy since CreateSpace will print and ship my paperback on demand. This can be done through other options like Gumroad, but I’m not aware of any option as seamless for the buyer or seller as CreateSpace. In short, I would probably sell more copies of my book and many of those copies would be bought by people who had never heard of me. I also wouldn’t have as much material to create before the launch. Far less potential for huge revenue because of the low price point. There would almost certainly be people who wanted to pay me more for the value I provide with the book, but they wouldn’t be able to because of the low prices on Amazon. I realize this sounds weird, but I had multiple people tell me, “What are you selling it for? I’m in for a copy at $39.” By selling on Amazon, I would be leaving about $30 on the table for each of those customers. I felt like selling this particular book for $5 was just way to cheap. This book in particular has huge value because it’s a guide for getting a higher salary. Everyone I worked with to help get a higher salary in 2015 got thousands of dollars more salary. A book that’s worth thousands or tens of thousands of dollars should be sold for more than $5. I didn’t know if I could bring myself to sell it so cheaply. I wouldn’t necessarily know who bought my book if I sold through Amazon. Gumroad would tell me who my customers were, but Amazon customers are Amazon’s and they don’t tell you who bought your product. So if I wanted to continue interacting with my customers after they bought my book, I would have to get clever. A workaround for this issue would be to offer downloadable bonuses in the book and direct readers back to the book’s website to claim the bonuses. My original plan was to go with the “Authority” option. That seemed like the option if I wanted to generate maximum revenue and charge a premium price for a premium product. But I spoke to Josh Kaufman at MicroConf 2015 and he encouraged me to go with Amazon. My book would be more discoverable there, and a book that does well on Amazon carries a lot of weight. Later, I became concerned that my audience simply wasn’t big enough to support a high-revenue launch ($10k+). And since I figured the launch would be my biggest opportunity for revenue, I had to think about what would happen in the long-term. I also realized I could tease apart all the things I was planning to offer on Gumroad. I didn’t have to sell the book and the audiobook and case studies and video courses all at the same time. I could start by selling the book and focus on making the book launch a success. Then I could focus on the video courses, hopefully riding the results from the book launch, and make those a success. In the end, I actually went with a sort of hybrid approach between the two methods: I grew my audience and provided great content throughout the year, and then launched the book on Amazon at a lower price. The result was that I hit #1 in two categories on Amazon (Vocational Guidance and Job Markets & Advice). That’s a very good result. As of this writing (December 31, 2015), my book is also the first result if you search Amazon for “salary negotiation”. On the other hand, my book is nowhere to be found if you search for “salary negotiation” on Google (at least for now). 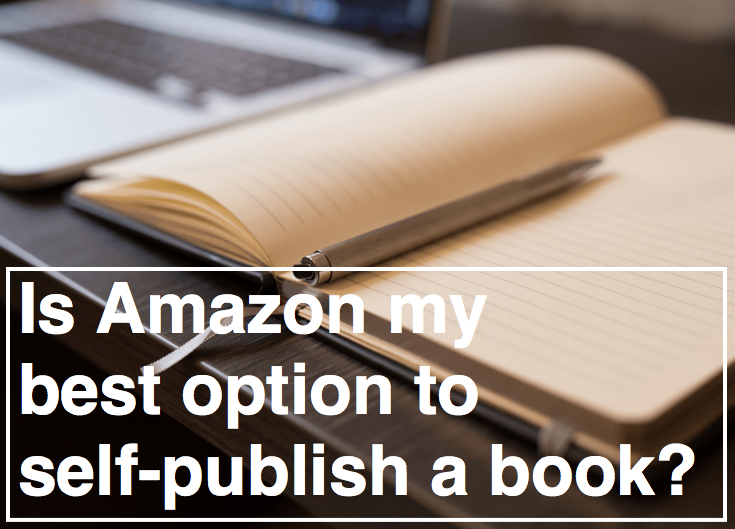 So how do you decide if you should self-publish on Amazon? I have listed three criteria below. You should review all the criteria and see which way the balance of these criteria point you. If you’re just writing a book to publish, Amazon might be better for you. It’s a more direct way to sell a book to a bigger potential audience and it’s searchable. If you have a bunch of materials you want to assemble to sell as a package—courses, case studies, interviews—Amazon makes that challenging and you might consider selling elsewhere. Will you have an audience ready to buy when you launch? If you haven’t started building an audience, do it now, regardless of whether you’re publishing on Amazon. Authority is a good place to start, and there are tons of other resources out there on building your email list. Also, Nathan’s app ConvertKit is optimized to help authors grow their audience—it’s what I used to go from zero to 750 subscribers this year, and I love it. That said, if your audience will be pretty large (let’s say 1,000 people who are engaged with you and interested in what you have to say) when you launch, then consider self-distributing through something like Gumroad. If your audience will be pretty small when you launch, then you’re probably better off selling on Amazon, which comes with its own enormous audience. Will your audience pay a premium? It’s very difficult to charge a premium for books on Amazon. They want books to be cheap because that attracts more customers, and they make it challenging to charge more than $9.99 for Kindle books. If your topic can command a premium and if your audience is primed to pay a premium, then you will probably be better off self-distributing. If your audience is not likely to pay a premium, or if you plan to sell your book cheaply (under $10 for eBooks), then Amazon is probably a better bet. If you have a premium product including more than just a book—courses, case studies, interviews, other components—and you have built an audience that will pay premium prices, you should probably distribute your book through something like Gumroad. You can charge higher prices, you’ll keep much more of the revenue, and the reduced discoverability of that smaller platform will be mitigated by the fact that people already know you and are willing to pay for your products. If you have a more vanilla product that you will price lower, and your audience is smaller and more price sensitive, then Amazon is probably your best bet because it comes with its own enormous audience and it has great search capabilities.